Bath is often referred to as the home of spa days and spa breaks. This is partly due to the abundance of great spa day venues in the area, and also because of the naturally hot spa spring water found in the city and within the original roman style baths. The city of Bath is a vibrant place with many unique shops, bars and restaurants to cater for anyone and everyone. If you would prefer a spa day with a bit more peace and quiet, then look no further that the Combe Grove Hotel & Spa - located within its own stunning grounds on the outskirts of bath, it offers a beautiful spa area for you to relax for as long as you wish. 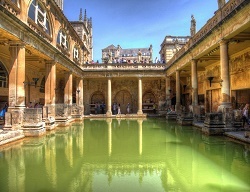 Within Bath is the famous and magnificent Thermea Spa Complex which has thousands upon thousands of visitors every year. Featuring many spa baths and facilities along with a glorious rooftop pool it’s easy to see why it is so popular. If this sounds like you perfect spa venue, then take a look out our Hilton breaks which incorporate a Bath Thermea Spa day voucher into their breaks – these include the Hilton Bath, Hilton Bristol and Hilton Swindon.